The night is the enemy, and the city of Philadelphia is its deadliest weapon. Becket is an ordinary teenage girl, wrestling with the upheaval of her parents' divorce. Her biggest problems to date have been choosing which colleges to apply to, living up to her parents' ambitious expectations of her, and fighting her secret crush on her best friend's boyfriend. That all changes the night she tries to save an innocent life and everything goes horribly wrong. Becket has been tricked into opening a door between worlds. As dark magic trickles into Philadelphia, strange creatures roam the streets and inanimate objects come to life, all of them bloodthirsty and terrifying. The city returns to normal when the sun rises each morning. The moment the sun sets, most citizens shut themselves in their houses and stay there no matter what they hear. The magic is openly hostile to most mortals, but there are some it seems to covet, trying to lure them out into the night. While Becket struggles to protect her friends and family from predatory creatures of the night, she is constantly tempted to shrug off her responsibilities and join them." This book just sounds awesome and I love that cover! 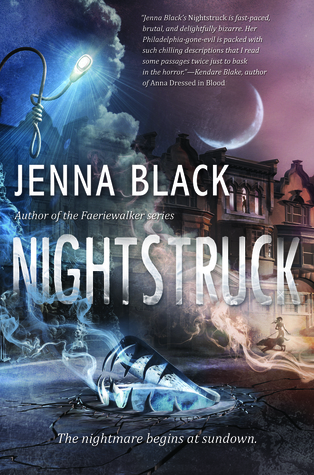 Nightstruck will be released on April 5, 2016. Look at that cover- those teeth! Wow! This one sounds interesting will be looking for your review. Oh yes! So cannot wait for this one either! Love Jenna's books! Oh. You had me at "the start of a spooky yet romantic dark paranormal horror series". HAH. I am definitely going to keep an eye out for this one! I need more paranormal in my life. That book does sound awesome! I just love the whole magical feel it has and I agree, that cover! So pretty! Great pick! This one sounds really good and creepy! I also like the cover a lot. Great pick, new to me but sounds good-- hope you get a chance to read it soon. I just found a new book to add to my tbr, this looks really good,plus look at the cover-gorgeous!! Oh, this does sound good! Definitely adding this to the list. Wonderful WoW pick! I am so intrigued by that cover and I will have to pick this one up. Thanks for sharing it and I hope we both love it! I do love that cover! But horror is not my thing. I'll wait and see how you enjoy it.